The corner of the Paris Book Fair devoted to e-book readers was larger than last year -- but the most interesting devices were smaller: smartphones running software from two companies aiming to adapt full-page comics and graphic novels to tiny screens. The companies, Aquafada and MobiLire, are taking slightly different approaches, although both are developing software that will allow readers to build virtual libraries that fit in their pockets. The French term for comics and graphic novels is "bande dessinée" -- literally, drawn strip -- but the format has little in common with the small black-and-white comic strips seen in newspapers. The richly colored, A4-size pages of a bande dessinée are often divided into frames of different sizes and shapes. To fit the images on a smartphone screen while keeping the text legible, then, MobiLire and Aquafada must do more than just display the frames one by one. MobiLire has taken its inspiration from the Japanese market, where more manga, or Japanese comic strips, are now sold on mobile phones than on paper, according to MobiLire's Vice President of Content Stéphane Amiot. The market there was driven by standardization on file formats suited to smartphone screens 320 x 240 pixels in size, he said. Some Japanese publishers are testing new strips on phones first, only printing them if the electronic versions are a success, he said. 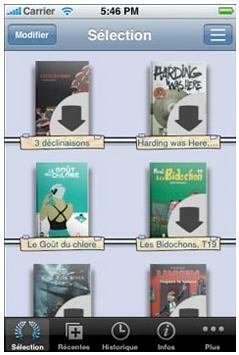 MobiLire's team of graphic designers works from PDF files of the original bande dessinée. "We have to cut up the big images, little by little. We may have two, three, even four images to tell the same story. The most important for us is to tell a good story," said Amiot. The company has already adapted 50 titles for a trial conducted with French mobile-phone operator SFR, and is looking for other content partners. Aquafada's AVE! Comics software runs on smartphones including the iPhone and the BlackBerry, but also on Macintoshes and PCs running Windows or Linux. Perhaps inspired by the larger screens it is working with, it takes a more cinematographic approach, panning and scanning around the page, lingering on key dialogs or details of the image. Its player software can run automatically, or hop from one point of interest to another on a key-press. It sells some comic books through Apple's iPhone apps store for about EUR5 (US$6.50), around half the price of a paper copy. On the iPhone, each title includes the AVE reader software, but the company also offers a virtual bookshelf application, allowing titles to be bought and downloaded from its own online store or "white-label" stores it operates for other companies. In that case, just the image data is purchased, as buyers already have the software -- and if they change phones or PCs, then they can use their account details to download the file to the new device without paying again. Alongside the colorful booths touting pocket-sized comics on phones, serious-suited staff from Sony, Bookeen and BeBook were pushing their much larger black-and-white e-book readers, all broadly similar in size and specification. Even Amazon's Kindle, not compatible with European mobile-phone networks, was present in an exhibit of e-book readers from around the world. Amazon recently launched an iPhone reader for e-books sold through its Kindle service, allowing people who own both devices to choose on which one they read. The Salon du Livre, at Paris Expo, runs through Wednesday.